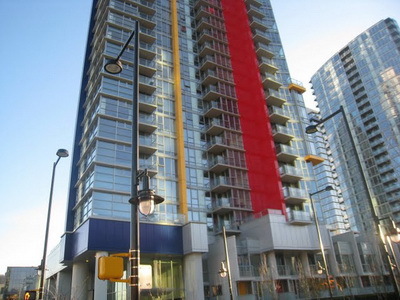 Concord Pacific Spectrum 4 is a stunning condominium hi-rise in Downtown Vancouver. 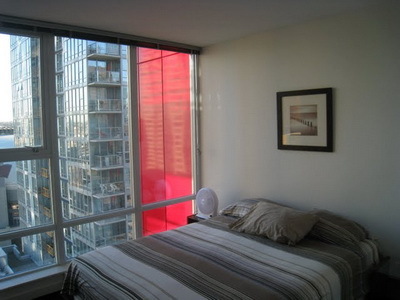 This one bedroom plus den apartment is located in a tower of glass and light that reflect the vivid colors of downtown Vancouver. You will be located in Vancouver's core - mere seconds from premier sporting events, with the sea wall just steps away as well as the hottest nightlife. You will discover the city you've never known before. You can walk to the best dining and entertainment experience of Vancouver's best. 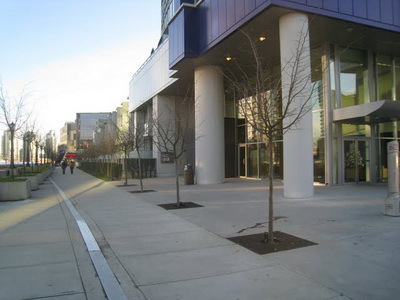 The building complex was completed in January 2008 and has won several awards for multi-family developments. 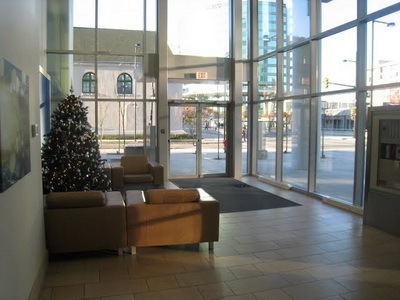 It is one of the hottest new properties in downtown Vancouver at this time. Security is provided by a digital key to access to the building and floor selection once in the elevator. A 24 hour concierge with security patrols of the complex site provide a real sense of security and control. The best of Vancouver is now yours to enjoy. 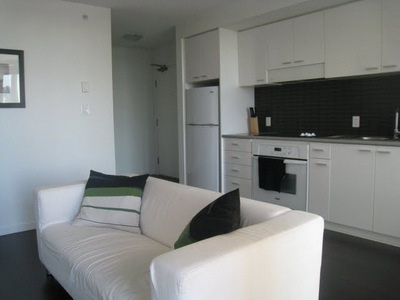 The apartment is all about detail with dramatic, dynamic open concept spaces defined with a unique statement of style. As you enter the apartment you will find the kitchen with integrated luxury appliances, contemporary white cabinetry with brushed chrome hardware, and a built-in wine rack. With a ceramic back-splash, electric ceramic cook top, and electric wall oven, this kitchen will be the place to cook a nice meal after an exciting day out accompanied by a nice glass of wine. 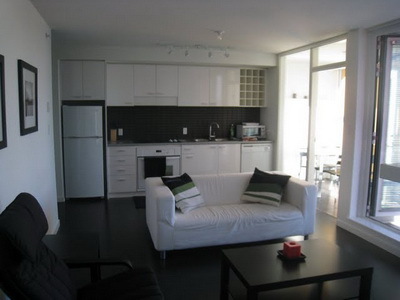 The laminated floors will then take you to the living and dining room. 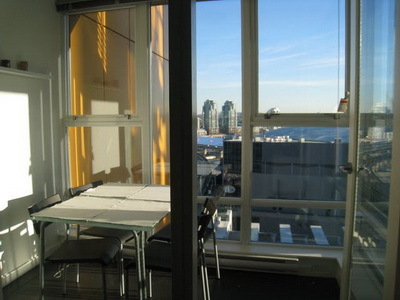 The dining room is surrounded by glass with a spectacular view of Vancouver's stunning landscape. 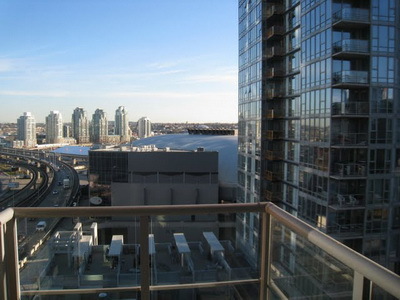 While you enjoy your food you will be part of the action looking out onto Rogers Arena. 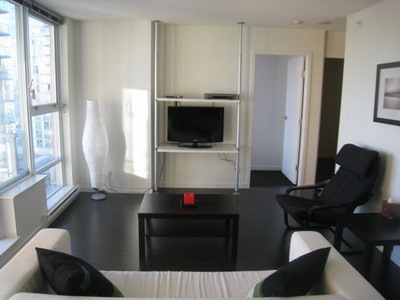 Relax on the sofa watching your favourite show or sports event on a 32 inch LCD TV connected to digital cable. The living and dining area are surrounded by glass and color so you don't miss the action and lights of one of the most scenic cities in the world. If you want to enjoy some fresh air you can go to the open balcony to look at the spectacular vistas and listen to the hum of the city. 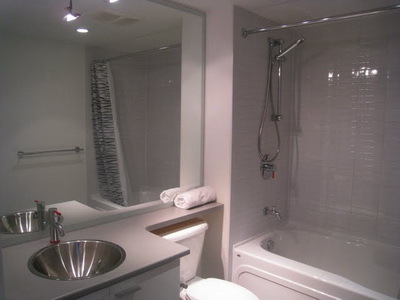 Need a touch-up...just use the full width vanity mirror with custom sandblasted frame in the bathroom. 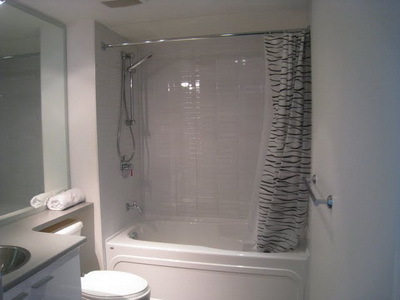 This spa-inspired bathroom with modern halogen light fixtures, soaker tub with modern shower combination, and chrome bathroom faucets will provide all the comfort that you deserve. 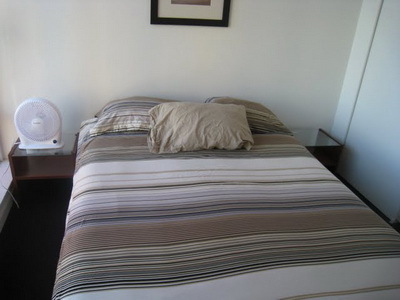 Getting ready for a well deserved rest, this cozy bedroom with a queen size bed is a great place to end your busy day. Still need to work or simply stay connected? Use the secure Wi-Fi enabled high speed Internet access. 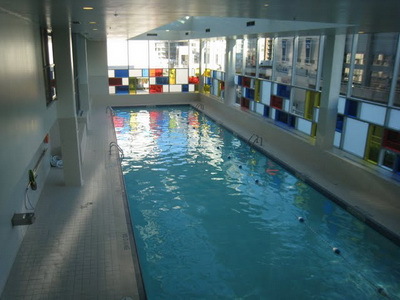 Practice your swimming strokes in the indoor pool or stretch your limits in the full-equipped Ozone club and fitness facility. 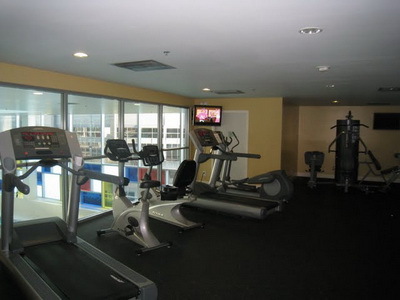 Melt stress away in the sauna or steam room or simply enjoy the grounds of the Spectrum building. 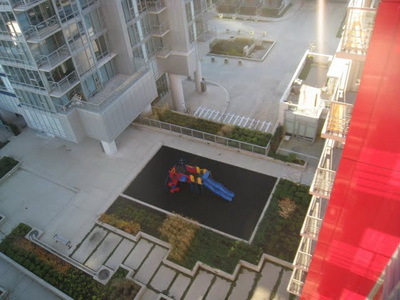 Located on the former Expo 86 lands in Vancouver's downtown core, between the Dunsmuir and Georgia viaducts, with a Costco store built underneath, this is a condo experience unlike any other in Vancouver. 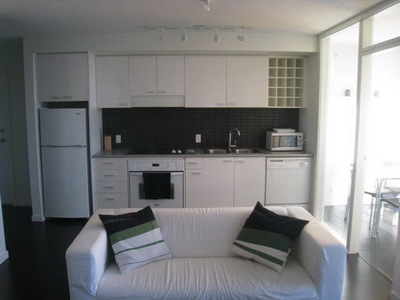 You will be close by in walking distance to Rogers Arena and BC Place. 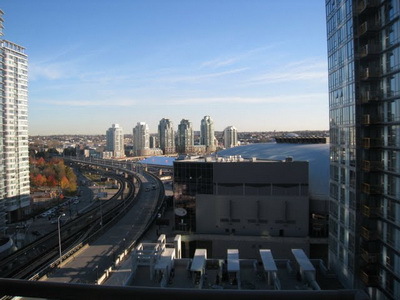 Its location makes a short 10-15 minute walk to Yaletown for shopping, fine dining and the wonderful Seawall for afternoon and evening strolls. Just steps from day and night street markets to historic Gastown to see the famous steam clock, historic buildings, tourist shopping and site-seeing. 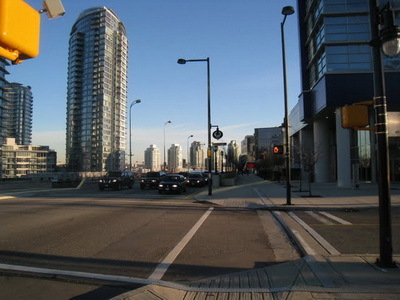 Near the famous Robson Street for hotels, shopping, sightseeing, fine dining, new convention center, international cruise terminal, marina and a 10 minute bus ride to the world famous Stanley Park. 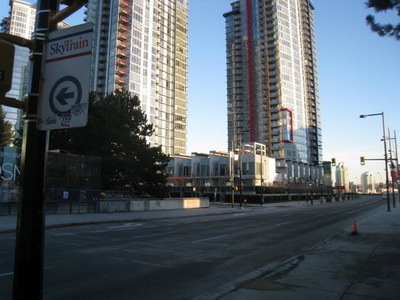 The Stadium station of the SkyTrain/Canada Line is right across the street from the apartment providing fast and inexpensive transportation to downtown Vancouver, the airport and other destinations. Double fold out couch in den can sleep 2.